A Lima-born Peruvian, Nikkei ‘Micha’ Tsumura was encouraged by his father to turn his passion for cooking into a profession and, after studying culinary arts in the US, he went to Japan to learn about his cultural and culinary heritage. Though he spent many months washing dishes, he learned vital knife skills and eventually how to cook rice and make sushi. 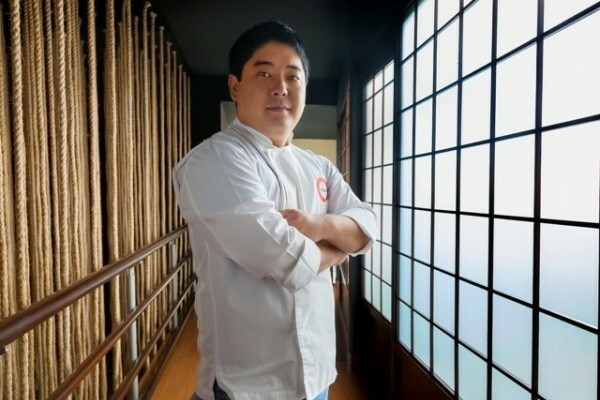 He took a job at the Sheraton on returning to Lima and, some years later, opened Maido, which reached No.8 in The World’s 50 Best Restaurants 2017. How does it feel to run the 8th best restaurant in the world? What is essential, beyond the ranking, and I have kept saying this since I opened the restaurant, is taking care of the details every day. That is the best thermometer of how well you are doing your job: how customers enjoy your cuisine, what their experience is, walking through the tables and feeling the clients’ joy. Being in that position of the ranking is of course an extra motivation for the entire team. Rather than being overwhelming, it encourages us to keep working and doing things the right way. In the end, we try to do so because it is our passion. Anyone who owns a restaurant and takes it only as a business or is mainly focused on gathering accolades usually won’t achieve either. Your mind has to be oriented to improving the customer experience. Everything else will come naturally after that. What is the Nikkei cuisine? If one analyzes the Peruvian cuisine and strives to understand it, and to understand as well why it has developed this much over the past decade, there are three very important factors. First, the Peruvian culture, the ancient civilization that we have had for thousands of years, which bears a gastronomic culture with techniques that still today continue to be used. Second, the biodiversity of the country. 75% of the world’s microclimates are present in Peru and that provides an amazing biodiversity. The third factor is the external influence that we have received from Europe, Spain, Italy, Africa, China and Japan. Anyone can tell that Peruvian cuisine has a lot of external influence, and especially from Japan. If we had to provide a definition, we could say that it is a Peruvian style of cuisine with a Japanese influence. My father is from Japan, and my mother’s ancestors also were Japanese. Nikkei means exactly that: of Japanese descendance. Of course, my Nikkei cuisine is a result of the influence of my family background. However, in the early days of my career I did not have the clear intention of becoming a Nikkei chef. I just enjoyed cooking. Nevertheless, as time passed, and especially back in Peru after living abroad, I understood that my mission was to create a cuisine that could unite two countries: the one where I was born, and the one that is my heritage, the blood running through my veins. Born only 8 years ago, your restaurant is now among the most prestigious in the world. How does a project achieve such success? It is a mixture of many factors. First, if one analyzes the explosion and internationalization of the Peruvian cuisine, it also began approximately at that time, around 8 years ago. Therefore, the success of our project somehow had to do with being at the right time at the right place. However, as it is usually said, you might be at the right time and at the right place but if you have nothing worthy to offer, you won’t succeed. So, along with being lucky, you definitely had something to offer. What? If I had to figure out what happened, why we are talking right now about Maido in this interview, I would point out several things: first, that our cuisine has always been flavor-oriented. There can be a lot of attitudes in cooking: innovate, research, search for beauty… but one can never lose the taste. And I consider that every dish we are serving, when you take it to your mouth you will be hit, you will feel a powerful taste. I don’t consider my cuisine as a subtle one. It’s rather powerful. Your dishes also sound innovative. We have built something different, we took risks in many moments by choosing a gastronomy that had not been offered ever before. We have created our own style, but with plentiful sense, with a lot of research on why we do things. We have, for example, created a world of Peruvian sushi, and we have made people understand that the Nikkei cuisine does exist, that it might be relatively new but bears a thriving concept: the power of Peruvian cuisine combined with the Japanese subtleness. You have mentioned that you took risks. Was it difficult to be so innovative? Quite. At the beginning, people did not understand our style. It was complicated to find customers willing to taste our Degustation [tasting] Menus. Until not so long ago, people used to go to restaurants just to eat their favorite meal, knowing exactly what they were going to taste. They were usually reluctant to tasting new and unknown flavors. At Maido, although we have a lot of usual clients that often order the same dishes, there is always room for surprise. A few years ago, this concept, surprise, was not as welcome as it is today. Nowadays, people are used to experimenting, and that is very helpful. Are there examples of dishes that at first were not welcomed by customers and now are extremely popular? Sure. Our meat sushi, for example. The use of meat in a sushi was very shocking at first. Or our famous “nigiri a lo pobre” (poor-style nigiri), made with meat, quail egg and a spicy sauce. People don’t usually associate these ingredients with sushi and it took some time for customers to accept these innovations. I always claimed that there are also people who never taste sushi because they don’t want to eat raw fish or seafood, and this was a way for them to taste it! We are bringing cuisine to a new world of experimentation. What about nuts and dried fruits? Do they have a prominent role in your cuisine? Yes. They are present indeed. For example, we have a codfish dish that we prepare following a genuine Japanese technique: we marinate it in miso for one day and then cook it on the grill. We serve it with Brazil nuts. The texture and taste of Brazil nuts are simply spectacular, and that is why we top the codfish with them. It provides a crunchy touch. We also use nuts, especially Brazil nuts, almonds and pistachios, and also dried fruits (mainly apricots, figs and dates) in our salads and desserts.